It’s today (Saturday 19/12/2015) in Casino Viage ! 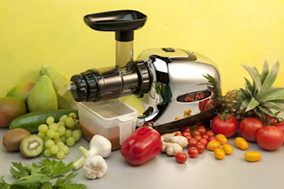 Join the workshop, try out some of the juices and pesto and buy the JazzMax slowjuicer with a special promotion. Ambika is organising a short demonstration about the art of juicing using a slow juicer. During the workshop you will discover the ins and outs of juicing and blending, which vegetable and fruit combinations work best, when to juice, how to prepare, how to clean, how to store. And of course, you’ll get to try a delicious juice. All ingredients are organic. The workshop takes places in Casino Viage in the center of Brussels on Saturday 19 December, you can register when arriving to the casino to any of the 4 available timeslots, 12 people max. per session. If you are still looking for a great Xmas gift for yourself or someone else, know that by attending the workshop, you’ll have the opportunity to buy a slow juicer (Jazz Max) with a special discount ! PS: registration is for free, you do need to buy your ticket for access to the general event via the website of Viage Casino. Categories: Workshop, Yogi food | Tags: Brussels, jazzmax, juicing | Permalink.